1. Place the potatoes into a saucepan and cover with salted water. Bring to the boil and cook for 10 minutes, until just tender. Drain well and toss with 1 tbsp olive oil. 2. Rub the chicken breasts with a little oil, then press into the dukkah to coat. Warm a large non-stick frying pan over a medium heat. Add the potatoes, their oil and the chicken in a single layer. Cook for 10-12 minutes, turning occasionally, until golden, the juices run clear and there is no pink meat. 3. 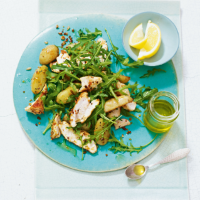 Slice the chicken, then toss with the potatoes, wild rocket, remaining olive oil and some seasoning. Great served with lemon wedges to squeeze over.